This was ‘the first radio detection and the first measurement of the magnetic field of a possible planetary mass object beyond our Solar System.’ It’s even bigger than Jupiter. Plenty of puzzles for scientists to investigate. 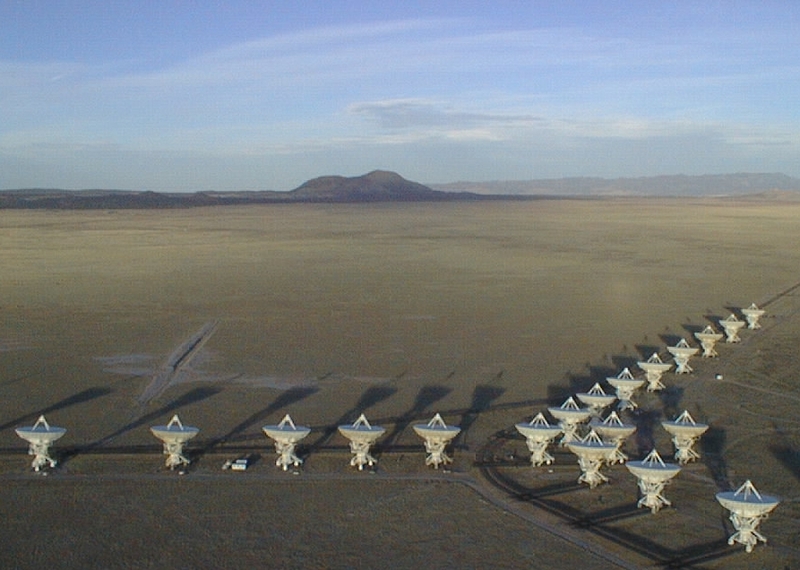 Astronomers have used the VLA to detect a possible planetary-mass object with a surprisingly powerful magnetic field some 20 light-years from Earth. It can help scientists better understand magnetic processes on stars and planets, says the National Radio Astronomy Observatory. (VLA) have made the first radio-telescope detection of a planetary-mass object beyond our Solar System. The object, about a dozen times more massive than Jupiter, is a surprisingly strong magnetic powerhouse and a “rogue,” traveling through space unaccompanied by any parent star. Last year, an independent team of scientists discovered that SIMP J01365663+0933473 was part of a very young group of stars. Its young age meant that it was in fact so much less massive that it could be a free-floating planet — only 12.7 times more massive than Jupiter, with a radius 1.22 times that of Jupiter. At 200 million years old and 20 light-years from Earth, the object has a surface temperature of about 825 degrees Celsius, or more than 1500 degrees Fahrenheit. By comparison, the Sun’s surface temperature is about 5,500 degrees Celsius. Very interesting. By my estimation of the mass increase of our sun to shift the earth’s orbit from 360 to 365¼ days, the amount was equivalent to 14x that of Jupiter. That mass was primarily formed of the “wandering” star known as Phaeton/Marduk, etc. as outlined in Allan & Delair’s 1995 book When the Earth Nearly Died. Released State side as Cataclysm in ’97. My supposition is that the planet was an ejected exoplanet from the sun’s companion binary system, as modeled by Nickolas Moeckel and Dimitri Veras in their 2012 paper. The strength of SIMP’s magnetic field also nests well with the proffered orbital trajectory-destruction scenario in the book. My exercise was driven by the question of how large a planet orbiting in the asteroid belt would have to be, and was based on magnifying Ceres until the gravity was between 1 & 2 times that of Earth. That also proved to fit well within the plot of various mass, velocity, density, and inertia parameters of the solar system bodies. the object has a surface temperature of about 825 degrees Celsius, or more than 1500 degrees Fahrenheit. a “rogue,” traveling through space unaccompanied by any parent star. Magnetic induction heating seems the likely source of its high surface temp. That implies the SIMP is a dense object. Such a surface temp is not likely to come from star radiation, but if it is in the vicinity of high magnetic field(s) it would explain the observation. The report says: 12.7 times more massive than Jupiter, with a radius 1.22 times that of Jupiter.